So about 2 weeks ago I bought a 1993 Legacy SS 5MT, fully stock, only 211k at an Auction. First thing I'd noticed was that the Panel underneath the Steering column was unscrewed and cables were hanging. When I started driving the car, it ran good except that I felt a little lag, than the CEL started flashing on a pattern, ended up finding out that it was throwing me a code "22" for knock sensor...I'am guessing whoever had it before me, did all the steps in order for the car to give me the codes... so I replaced the knocked sensor, which was cracked but forgot to unplugged the black read memory connector when I repaired the problem and now the CEL light wont stop flashing, don't matter what I do, I tried resetting it and still keeps blinking, car runs fine but keeps blinking... ANYONE have and idea of this could be?? really appreciate it, thanks for reading. There are 2 sets of diagnostic connectors. A black pair and a green pair. There's some more info in this link for you. If the CEL blinks steady it means there are no codes. 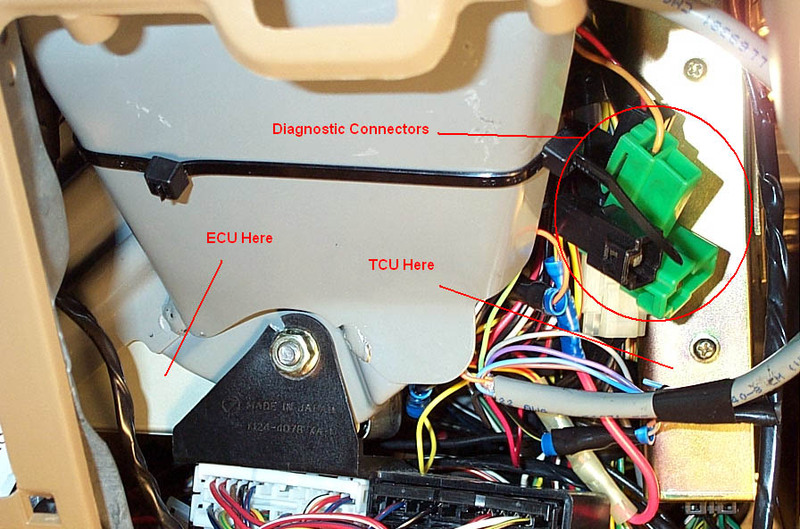 Make sure both the black and green diagnostic connectors are unplugged. Here is a picture of both. Unhook your battery for an hour, it'll reset the ECU. After you put the battery back on, it should be fine. Leave the green and black unconnected. You sure the black and green plugs are unconnected? The "other" black connectors need to stay plugged in. If those are disconnected and the light is still flashing I would double check to make sure someone hasn't tapped into those wires or the wires are not shorted anywhere, which would cause the ECU to do what you're describing.